For centuries, biblical scholars have toiled and speculated over this abstruse passage in hopes of unlocking its secret, which had been intended to be not only a portrait of the birth of Jesus, but a sign for the last generation of history who would bear witness to it two thousand years later, and this is exactly what has happened. 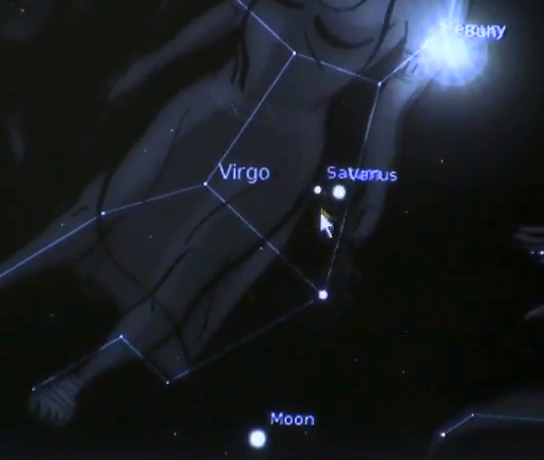 On the 4th of October, 2011, the constellation Virgo fell into position with the planets Venus, Saturn, and the Sun and Moon, using the stars to draw out John’s vision in the sky. To understand how this fulfills Revelation 12, let’s decipher the prophecy by breaking it down bit by bit. First, it starts by saying, “And there appeared a great wonder in heaven”, which tells us that this is a cosmic sign of some sort. The next verse elaborates on what this sign is going to look like, “a woman clothed with the sun, and the moon under her feet, and upon her head a crown of twelve stars.” Last October, anyone with a telescope or planetary software would have been able to look up and observe the positioning of the sun as it sat behind the constellation of Virgo, making her body appear brilliant with light. The moon then drifted beneath the feet of the constellation, and in her head region could be counted exactly twelve stars, no more and no less. All three of these components directly fulfilled the description of the woman in Revelation 12 that’s clothed with the sun, with the moon beneath her feet and a crown of twelve stars. These twelve stars encompassing her head are clearly representative of the twelve tribes of Israel, and the constellation Virgo, which is Latin for “virgin”, is depicting the virgin Miriam, who gave birth to Christ through immaculate conception. The next verse says, “And she being with child cried, travailing in birth, and pained to be delivered.” Here’s where the picture all comes together. The 29th of September last year was the sacred Feast of Trumpets, an annual holy day that God had set in place thousands of years ago as a rehearsal for divine appointments which He promised to fulfill at the end of the ages, and it was on this date that the planet Venus came into convergence with the constellation Virgo, which, from our perspective, appeared to sit in Virgo’s womb as if she were pregnant. Six days later, on the 4th of October, Venus then exited the womb from between Virgo’s legs to complete the prophecy of a mother giving birth to a child. If we can set aside the Pagan terminologies for a second and remember that the planet Venus has nothing to do with primordial Roman mythology, Revelation 22:16 will then remind us what Jesus meant when he said, “I am the root and the offspring of David, and the bright and morning star.” As we know, the planet Venus is the bright morning star, so what we saw take place last Fall was essentially a celestial telling of the story of the birth of Jesus Christ through His mother Miriam, as well as a direct fulfillment of Revelation 12’s prophetic sign of warning. “And there app eared another wonder in heaven; and behold a great red dragon…” You’ll notice that this prophecy contains interpretations that play out on many different levels. Just as Jesus was literally born two thousand years ago and then birthed as a sign in the heavens two thousand years later, so too is the “great red dragon” symbolic of both an astronomical sign and King Herod the Great, who sought to kill the newborn baby Jesus and ended up slaughtering every child in Bethlehem that was under the age of two. This is what is meant in Revelation 12:4 by, “and the dragon stood before the woman which was ready to be delivered, for to devour her child as soon as it was born.” The word “dragon” is a term in the Bible that is reserved exclusively as a reference to Satan, but the term “red dragon” can also be equated with the planet Saturn. 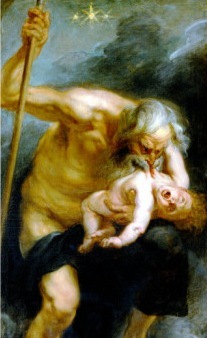 Interestingly enough, in Greek mythology, Saturn was a Titan who, after hearing in a prophecy that he would one day be overthrown by his own son, set out to eat his children as soon as they were born so to prevent this from happening. Sound familiar? Sure enough, just as the prophecy seems to imply, the planet Saturn was right on cue in this drama that played out along the night sky, looming right next to Venus as it made its exit, waiting to devour it. To finish off this amazing display, we then saw the Draconid meteor shower fall on the 8th of October, which just happened to be on Yom Kippur, the holiest day of the year. The word Draco is Latin for “Dragon”, so to see the fall of the Draconids just four days later might represent the fall of the angels, as the prophecy of Revelation 12 further states in verse 4, “And his tail drew the third part of the stars of heaven, and did cast them to the earth“, completing the fulfillment of this prophecy and making the odds of this event being a mere coincidence absolutely astronomical, no pun intended. Modern technology has allowed us to calculate whether this was a rare astronomical event or something that happens relatively frequently, and it was discovered that this perfect configuration of Venus, Saturn, the Sun, Moon, and Virgo had only occurred one other time in all of history, 2000 years ago during the time of Jesus’ birth. It’s also interesting that Virgo is always depicted as holding a palm branch, just as the Jews held palm branches to usher in Jesus’ during His triumphal entry into Jerusalem. Now, we’re ushering Him in for the second and last time, where He will rule over the earth, blotting out pain, sadness, and death forevermore. This is the beautiful picture that God brushed across the sky last year, a crucial prophecy of the very last days and a sure sign of the hour of our redemption. May the grace of Jesus Christ be with you! Mike, I love the ideas that you’re bring to this. I myself have been a post-tribber all of my life until last year, but I’m not going to try to defend my beliefs, because I’m just so thrilled to hear that we’re on par with the one truth that matters most – Jesus is coming to get us soon. I believe that there is always room for learning new things, because God is constantly opening our eyes to a more and more complete version of His Word. I will definitely think about what you said and contemplate it. Food for thought, as I always say. If you want to know more about Saturn, I myself have been doing a study on Saturn for a book that I’m writing, and further knowledge of this subject is going to require a careful step into the world of the occult. We must remember where things come from, like why we wear wedding rings and why saints always where halos in old canonical frescos. The reason for both of those things comes from Saturn. The ancient people knew Saturn as “the Lord of the Rings”. Interesting, isn’t it? They knew, even before telescopes, that Saturn had rings. They were given knowledge from Satan, who guised as Saturn. And now, we’re entering the Christmas season. If you trace back all of the Christmas traditions that we uphold, they all go back to an ancient roman festival known as “Saturnalia”, which occurred during the winter solstice (December 15-25). Saturn is also symbolized by the shape of a hexagram, which has sadly become Israel’s national symbol, the hexagon, which appears on a strange formation on Saturn’s surface in some space photos, and it is also symbolized by the shape of a black cube, an object which muslims revolve around counter-clockwise in mecca. I don’t know if you already know all this, but it’s something that we should take into account when learning about the enemy. Thanks again, Mike, for your comments and inspirations. Have a blessed day.